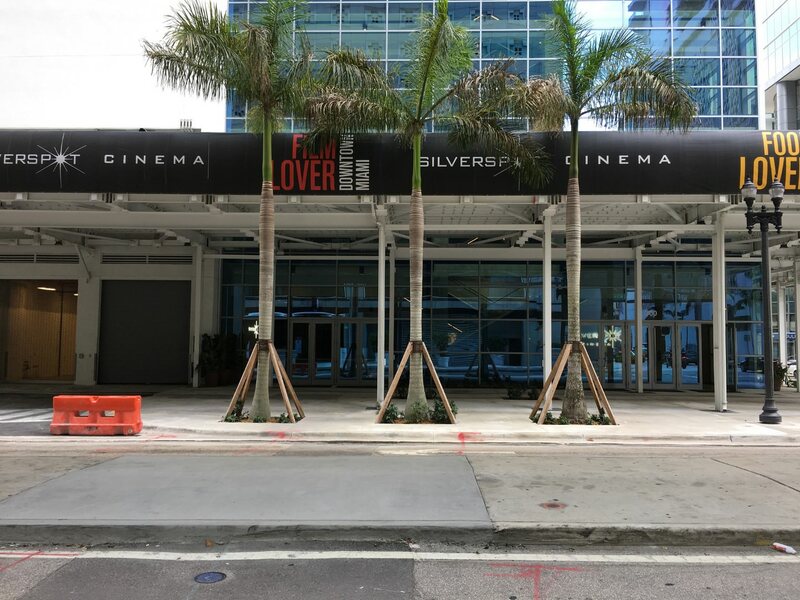 Downtown Miami’s Silverspot Cinema is now open, and early impressions are good. The new six-story theater includes 16 screens, along with a bar area. On both Facebook and Google, reviewers praised the reclining leather seats, food quality, screen setup and overall comfort of the new theater (although one review complained about parking costs). 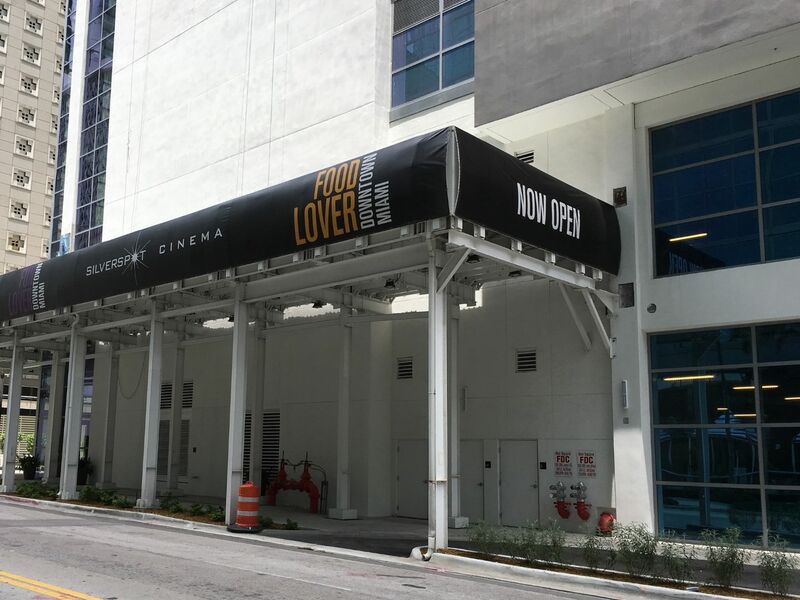 This is the second theater to open in the area recently, after the CMX Theater at Brickell City Centre, which opened a year ago. 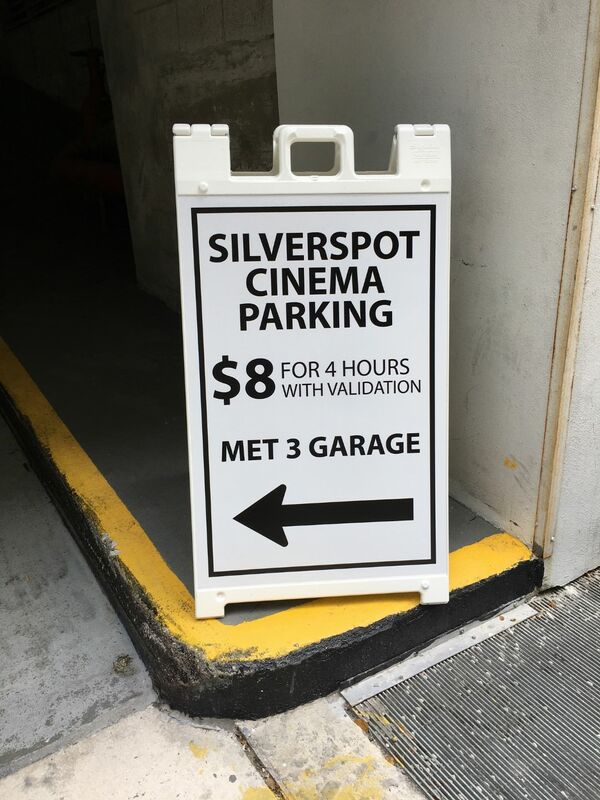 The new Silverspot is part of a complex called Met Square. 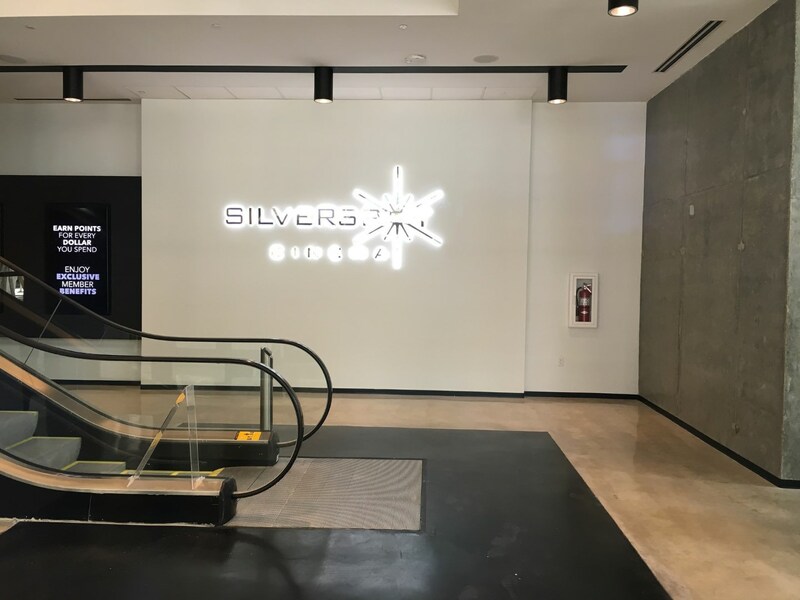 Completion of the Silverspot took over three years, following several years of planning. Test piling for Met Square began in 2014, but full foundation work didn’t start until May 2015. The remainder of Met Square, including a 43-story, 391-unit apartment tower called Muze, along with restaurant space and a Real Madrid Cafe, remains under construction. we need a reasonably priced movie theater in DT. Enough of the eat-in theaters they are to $$$. It would be great if O cinema opens on Flager St. The key word in your comment was DT which I believe you mean Downtown Miami, that is never going to happen. Two reasons, first the rent that theaters pay is too high and second luxury chains are the only ones who can afford to open their theaters in such locations. The closest people in Downtown can hope for is the new AMC that is being built by the river. Please explain the AMC on Lincoln road. ITS ALMOST $10 LESS PER TICKET THAN CMX… GIVE ME A BREAK! We don’t live in Kendall, we can afford to have premium movie theaters. Are you serious? How old are you to be offending with the places where people live. Kendall can have premium movie theaters. Just because you live in a over expensive one bedroom appartment in downtown miami doesn’t mean you’re entitled to being able to “afford premium movie theaters”, you can barely pay rent tony shut up. Why would you drive there to see a movie with the transportation alternatives available to you? I live in South Beach. What are the transportation options?? Probably the reverse of when I lived on the mainland and went to see a movie on Lincoln, took the bus. In your case you’d add Metro Mover to that. Yeah! I bet you did. So what are you telling Anonymous up above is to get date in this blistering humidity and with a possibility of a thunderstorm and walk with her to a bus shelter, wait for god knows how long and take the bus to downtown where then he can impress her by paying $23 per ticket, only to do the reverse after the movie ends. Get the hell outta here! Let me explain something to all of you once and for all. Public transportation (Bus and Metro) in Miami is used by poor people, period! For the rest of us a car will always be involved, either our own or and Uber/Lift. End of the story. “‘let me explain something to you all once and for all”, that where you get canceled, sweetie! I guess hearing the truth bothers you sweetie? When was the last time you took the bus? I live on the beach and take the bus at least a few times a month. And get this: I’m not poor! *GASP* AND I always stay dry. WOW! I’d much rather spend 2.50 and know when I’ll arrive than spend minimum 5 bucks and probably wind up in an Uber with drunk af Chad and Mark, with an added 10 minutes to bring them to E11even. I understand the bus isn’t for everyone, but don’t be an @$$. Hmm if you are sharing an Uber with Chad and Mark you are probably on a budget trying to save a few bucks. Dude, it’s ok to be poor don’t be embarrassed. Yeah, great idea! I will ask my date: Hey lets go to the movies and take a bus…. I’m shocked your date would even say “yes” to a movie. 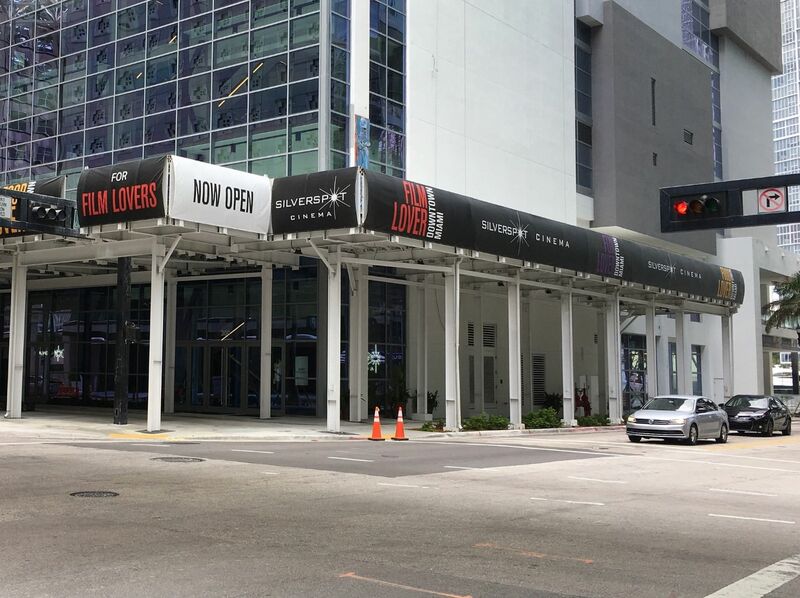 Let’s be honest, this is Miami, no chick is going to be impressed by you taking her to a movie. Plenty women don’t mind going to see a movie. Have you seen the price of tickets at theaters lately? A movie is a great date activity either before or after dinner/drinks. This dude finds it demeaning to ride a bus with his date to go see a movie but he feels not having a car is just fine. When did I say not having a car is just fine? Well said my friend. I am so sick and tired of people on this site that preach ditching your car and taking public transportation. As if there was a metro station at every corner, if you live in South Beach sadly there are no options. Hopefully that will change someday but it will a long time from now. Beach is gone in 40yrs. why would u spend public money in that pit. Ok snowflake go on and believe that. Heck, the housing and where you live right now might be gone in 40 years but that doesn’t stop you from living there at this moment. I live in Little Haiti, Besides waiting for a bus in an uncovered stop for half an hour, what are my transportation alternatives? What has your transportation alternatives always been to go downtown? How can you say none when talking about transportation alternatives and then mention driving and Uber? Ride a bike! Seriously, it’s a flat, straight shot. There should be bike infrastructure on one of the avenues, or all: NE 2nd, Miami and NW 2nd. If I wanted to commit suicide, then yeah, sure, that will be the day I finally ride a bike in Miami. I’m very pro-cycling, but I would never tell anyone in Miami to bike somewhere. Way too dangerous. Advocate for infrastructure to make cycling safe. Be part of the solution. I am. Was one of the supporters behind the Complete Street that was added in Downtown. In typical Miami fashion, the few times I have walked/driven by the Complete Street, it is almost always being used improperly; cars parallel parked in the bike lane, cars using the bus lane, UPS trucks parked all over the sidewalk, bike lane, bus lane, or wherever they want to park, etc. Until Miami residents respect this city and their fellow residents regardless of the type of transportation they use, biking and walking in Miami will not be that safe. You do realize this happens in every major city right? Lol, spoken like a robot…..”Thid happens in every city”. Obviously someone who has never traveled anywhere. LOL. If you think this isn’t a problem in every major city you are seriously mistaken. I hate it when people such as yourself blame the mundane and banal on the city of Miami. “OMG traffic” Only in Miami!!! GTFO peasant! Little Haiti? You can take the Jittney. The canopy over the sidewalk looks unfinished. Is there more to add or is this the final look? TFW it’ll be cheaper to smuggle food in from Whole Foods Market than buy overpriced concessions. Miamian’s will always have car’s to move around no matter what generation is coming to Miami. People will always need personal car’s to move around in Miami Dade County. We are thankful that Uber & Lyft is our second alternative to move around quicker than using public transportation. Take a public transportation in Miami and you will be riding along with homeless and thugs and not to mention the waiting time on a hot steamy or rainy day for the bus to come on time. These Foreign Developers or out of State Developer have no idea how Miami works. Miami will never be Newyork, Chicago, Sanfrancisco, or any foreign country with great public transportation system. Wow, a person who’s seen the future…..
You don’t need to see the future to know this to be true. Okay. You should play Mega Millions right now. I went to it this Saturday and some of the food was awful like the lobster rolls and brownie and all the food is packed inside to-go boxes so some of the food was smashed. Also remember to validate your parking before you leave and parking is in the whole foods parking garage. Thanks for the answer. Well, it is a little better than Cinemex but still kind of high. I will try it one time just to say I did, but for the most part I prefer to go to Merrick or Cocowalk. The construction workers on Muse seem to be some of the slowest in history. You can always find them in Whole Foods talking than on their site completing things. ZOM must have deep pockets to bankroll this! $8 for 4 hours? That’s the deal of the century in other downtowns like NYC, Chicago, etc. Sign up for a community class at MDC that meets once a week and you get a parking pass for students in downtown for next to nothing good in their garages for the semester. Sign up for beginning chinese for no credit on the weekends and even if you skip class, parking pays for itself and you get a student ID card. Awesome tip! Cheap parking And a student ID that probably gives you a discount on movie tickets! Higher education at MDC IS worth it! Yes, this is what MDC is good for, parking passes for overpriced movie theaters. Newsflash!!! MIami is not New York or Chicago……Nothing like it and development and population here are completley different from these cities. Just opened! Amazing experience at a much lower price than most VIP theaters. At $17 the ticket. Food is awesome, service is great. Seats are so comfy and fully reclinable. Highly recommended. There are 2 parking options at $8 and $10, these prices are common in Downtown. Obviously you can take uber or just walk. Again, this experience is worth it. 8 of you get it validated is not then its $40 which i found out the hard way. Damn! Your comment reminded me of the movie I saw last night on HBO called Napoleon Dynamite, when uncle Ricco tries out the time machine and gets zapped in the groin, lol. Hurray! Another overpriced movie theater!! Well, if you can’t afford it, then don’t go. If you’re on here complaining about the price of movie tickets then you should just sign up for MoviePass.